Doctor Reid retired from the clinical practice of Neurosurgery January 1, 2019. 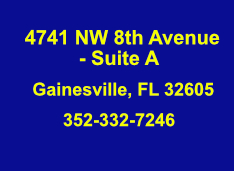 Dr. Reid's office is conveniently located near the Gainesville Campus of Southeast Integrated Medical (Simed). This facility provides integrated medical services from a select group of highly qualified, board certified specialists. It also contains: a full service pharmacy; medical laboratory; physical therapy; clinical psychology; and radiology department (including x-rays, CT, MRI, ultrasound, mammography, and bone densitometry). We understand some people have difficulty walking, so we provide front door parking and transport assistance. We Support Doctor Lifeline's mission to prevent physician suicide. Copyright 1997, 1998, 1999, 2000, 2001,2002,2003,2004,2005, 2006, 2007, 2008, 2009, 2010, 2011, 2012, 2013, 2014, 2015, 2016, 2017, 2018 Steven A. Reid, M.D., Gainesville, Florida ; All rights reserved. Web site funded, designed and programmed by Steven A. Reid, M.D.